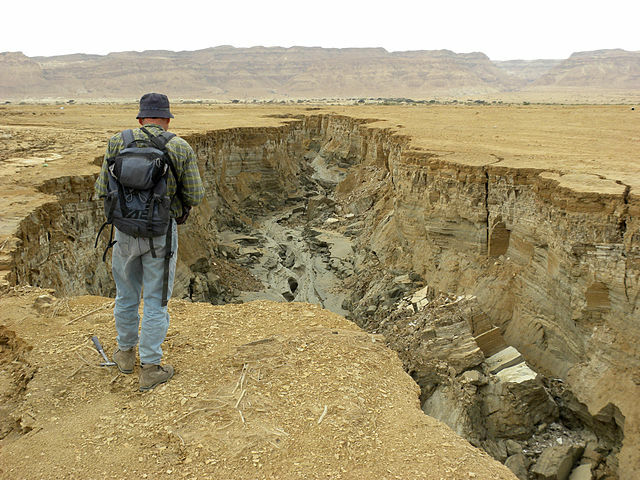 According to one source, the average erosion rate of all of the continents of the world is about .061 millimeters per year.1 This is small, only 6% of one millimeter. But even accepting this very small rate, some simple arithmetic reveals some astounding results. According to standard evolutionary geology, the very top of the Grand Canyon was formed some 250 million years ago. I mention the Grand Canyon only as a convenient point of reference. At the average rate of erosion of .06 millimeters per year, how much erosion would have occurred for such a surface over 250,000,000 years? Fact check: .061 mm * 250,000,000 yrs = 15.25 km, or 9.5 miles! Go ahead and look at the floor you are standing on right now. Now think of going down into the deep darkness of the earth ten miles below your feet. That’s how much ground would have been eroded in ‘just’ 250 million years. Which is still just 1/20th of how old they want to make the earth. To put this in another perspective, even at the Grand Canyon’s highest point, it is some 9,000 feet (2.7 km) above sea level, meaning that the whole thing should have eroded away some five times over! Ten miles is near double the height of Mt. Everest. So how in the world is the Colorado Plateau still there? Indeed, why haven’t the continents washed away, essential into the sea by now? As Ariel Roth states: “Using [this same rate of erosion], a number of geologists point out that North America could be leveled [i.e. into the sea] in ‘a mere 10 million years’” (ibid.). Fact check: 2.7 mm * 50,000,000 yrs = 135 km (83 miles). Mt. Everest is a whopping 5.5 miles high, but has it really been completely eroded 15 times over?! And where are those 83 miles worth of disposed sediment? Ecclesiastes 1:7 All the rivers flow into the sea, Yet the sea is not full. To the place where the rivers flow, There they flow again. For further reading: http://creation.com/eroding-ages, http://creation.com/do-rivers-erode-through-mountains. This was originally published as a short “Creation Corner” article in a church bulletin. But could uplift have compensated for the erosion? Note that this article was originally published as a 1 page max “Creation Corner” article in March of 2010. That limitation of space didn’t allow me to address a very important objection to this case, which is that mountain uplift could have kept compensating for this continual erosion. The problem with this supposition is that everyone agrees that the marine fossils that are entombed within the top sedimentary layers of Mt. Everest were originally deposited, along with those sedimentary layers themselves, while those layers were still undersea, that is, prior to when the tectonic forces uplifted what was then the sea bottom to it’s present height. For creationists, this upheaval would have occurred rapidly at the later half of the flood event, for naturalists, it happened slowly but still surely over the last 50 million years or so. So the problem with this is as follows: Even if many other sedimentary and fossil bearing layers have already been eroded away, it still would not have taken long before all of those layers were completely eroded away. Remember, the entire mountain should have been eroded away twice over by now. But there those layers are, testifying to the fact that the mountain and those layers are still young, comparatively speaking. Those tens of millions of years didn’t erode away those top sedimentary / fossil bearing layers because they never happened. There was a lot of further discussion on this topic, including critical clarifications by myself that show why uplift cannot solve this problem (the strata are horizontal and should long ago have been eroded away) HERE on Michael Brown’s website, in the comments section (see link). Just search my name (Nicholas Petersen) or search “Everest” on that page to hone in on the relevant parts. I hope to add some of this material here (or in a new article) sometime. This article was originally greatly limited in size (max of 1 page in a church bulletin), so I couldn’t add anything more than I did.